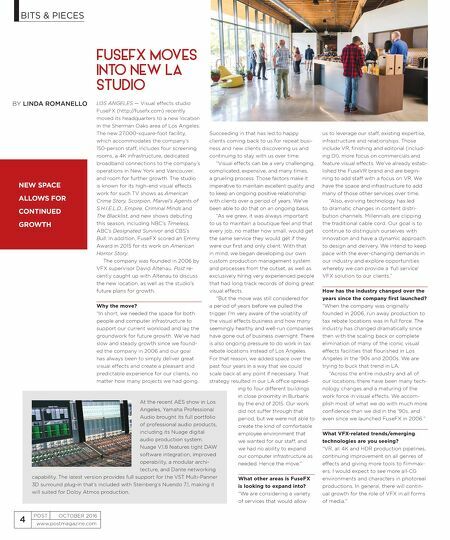 BITS & PIECES www.postmagazine.com 4 POST OCTOBER 2016 FUSEFX MOVES INTO NEW LA STUDIO LOS ANGELES — Visual effects studio FuseFX (http://fusefx.com) recently moved its headquarters to a new location in the Sherman Oaks area of Los Angeles. The new 27,000-square-foot facility, which accommodates the company's 150-person staff, includes four screening rooms, a 4K infrastructure, dedicated broadband connections to the company's operations in New York and Vancouver, and room for further growth. 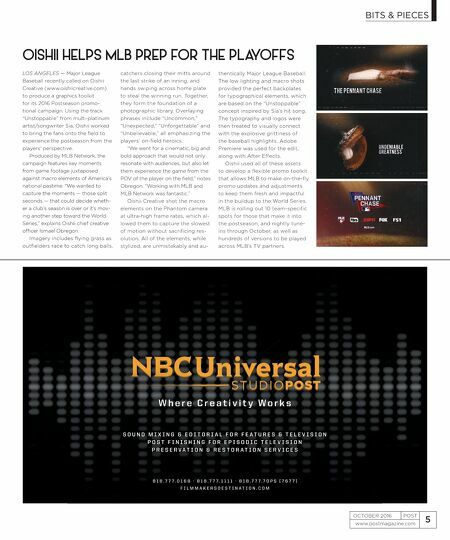 The studio is known for its high-end visual effects work for such TV shows as American Crime Story, Scorpion, Marvel's Agents of S.H.I.E.L.D., Empire, Criminal Minds and The Blacklist, and new shows debuting this season, including NBC's Timeless, ABC's Designated Survivor and CBS's Bull. In addition, FuseFX scored an Emmy Award in 2015 for its work on American Horror Story. The company was founded in 2006 by VFX supervisor David Altenau. Post re- cently caught up with Altenau to discuss the new location, as well as the studio's future plans for growth. Why the move? "In short, we needed the space for both people and computer infrastructure to support our current workload and lay the groundwork for future growth. We've had slow and steady growth since we found- ed the company in 2006 and our goal has always been to simply deliver great visual effects and create a pleasant and predictable experience for our clients, no matter how many projects we had going. Succeeding in that has led to happy clients coming back to us for repeat busi- ness and new clients discovering us and continuing to stay with us over time. "Visual effects can be a very challenging, complicated, expensive, and many times, a grueling process. Those factors make it imperative to maintain excellent quality and to keep an ongoing positive relationship with clients over a period of years. We've been able to do that on an ongoing basis. "As we grew, it was always important to us to maintain a boutique feel and that every job, no matter how small, would get the same service they would get if they were our first and only client. With that in mind, we began developing our own custom production management system and processes from the outset, as well as exclusively hiring very experienced people that had long track records of doing great visual effects. "But the move was still considered for a period of years before we pulled the trigger. I'm very aware of the volatility of the visual effects business and how many seemingly healthy and well-run companies have gone out of business overnight. There is also ongoing pressure to do work in tax rebate locations instead of Los Angeles. For that reason, we added space over the past four years in a way that we could scale back at any point if necessary. That strategy resulted in our LA office spread- ing to four different buildings in close proximity in Burbank by the end of 2015. Our work did not suffer through that period, but we were not able to create the kind of comfortable employee environment that we wanted for our staff, and we had no ability to expand our computer infrastructure as needed. Hence the move." What other areas is FuseFX is looking to expand into? "We are considering a variety of services that would allow us to leverage our staff, existing expertise, infrastructure and relationships. Those include VR, finishing and editorial (includ- ing DI), more focus on commercials and feature visual effects. We've already estab- lished the FuseVR brand and are begin- ning to add staff with a focus on VR. We have the space and infrastructure to add many of those other services over time. "Also, evolving technology has led to dramatic changes in content distri- bution channels. Millennials are clipping the traditional cable cord. Our goal is to continue to distinguish ourselves with innovation and have a dynamic approach to design and delivery. We intend to keep pace with the ever-changing demands in our industry and explore opportunities whereby we can provide a 'full service' VFX solution to our clients." How has the industry changed over the years since the company first launched? "When the company was originally founded in 2006, run away production to tax rebate locations was in full force. The industry has changed dramatically since then with the scaling back or complete elimination of many of the iconic visual effects facilities that flourished in Los Angeles in the '90s and 2000s. We are trying to buck that trend in LA. "Across the entire industry and all of our locations, there have been many tech- nology changes and a maturing of the work force in visual effects. We accom- plish most of what we do with much more confidence than we did in the '90s, and even since we launched FuseFX in 2006." What VFX-related trends/emerging technologies are you seeing? "VR, all 4K and HDR production pipelines, continuing improvement on all genres of effects and giving more tools to filmmak- ers. I would expect to see more all-CG environments and characters in photoreal productions. In general, there will contin- ual growth for the role of VFX in all forms of media." NEW SPACE ALLOWS FOR CONTINUED GROWTH BY LINDA ROMANELLO At the recent AES show in Los Angeles, Yamaha Professional Audio brought its full portfolio of professional audio products, including its Nuage digital audio production system. Nuage V.1.8 features tight DAW software integration, improved operability, a modular archi- tecture, and Dante networking capability. The latest version provides full support for the VST Multi-Panner 3D surround plug-in that's included with Steinberg's Nuendo 7.1, making it will suited for Dolby Atmos production.